Going Toggin: It's STILL a COLD WATER BITE! Getting a lot more bites & throwbacks though -- tagging more. Some anglers will likely do OK - not everyone. Going Wednesday, Friday, & Saturday April 6th, 8th, & 9th - 7AM to 3PM - $110.00 - 12 Sells Out.. Opening May 15th Through May 31st For Sea Bass. I do not anticipate easy bag limits. Reservations Required - See Way Down Below & Be a half hour early! We always leave early! We have also used reef blocks (many now supplied by Potomac Valley Brick) to restore reefs that were once productive, but have scoured-in. Just as your feet 'scour-in' when a wave recedes from the beach, a rubble reef built too low will silt-over as currents dig it in. We're now using old reefs lying just beneath the sand as a foundation for our small-scale block reefs. It's working nicely. 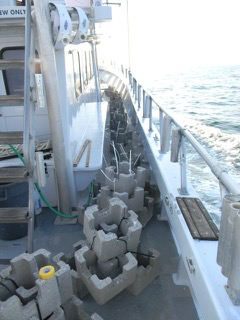 We also use reef blocks to tie several larger pieces together. If two robust reef units are less than 50 feet apart, we can drop blocks in the gap and make it one reef. We typically take 12 blocks on a fishing trip - closing in on thirteen thousand blocks. One day the management community will take note: Not only is reef restoration, including oyster restoration, vital to fisheries restoration; but it's a pretty dagoned simple way to make spawning habitat for tautog, fluke, lobster, & sea bass. Lots of other critters use reef too in one life stage or all..
For less than the cost of a couple miles of highway or a single fighter jet, we could change fishing in all of the Mid-Atlantic for the better. When I sent my last with Cheech & Chong's look at MRIP, the forecast had rain for Friday & wind for Saturday. Things look a lot better now. I still have a ton of room for Wednesday 4/6/16 too. Seen from our side of the regulatory divide, however; I think most of us wonder if sanity has been absent federal fisheries, at least where recreational catch & regulation is concerned.. It's entirely possible that some anglers in northern states will be allowed more tuna than sea bass this summer. Is there any possible way that could make sense? What we have today are regulations hijacked by bad data. Need to focus fisheries restoration efforts on biology, not wildly inaccurate statistics.